Who says Europe has the lock on memorable train stations, with impact, charm and local feel? OK, sometimes that's me. 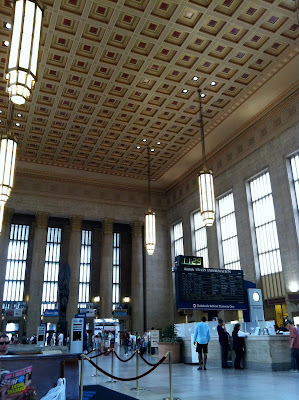 But I don't feel that way where Philadelphia's 30th Street Station is concerned. No one tried to snap it up to some horrible mash-up of contemporary or expedient architecture overlaying the bones of the original. It is pretty much what it has been, at least in the main hall. And with so, so many memories affiliated with my arrivals to and departures from that hall over so, so many years (beginning in 1976 with my first train travel anywhere), it was love at first sight. Like most first loves, there's a warmth of feeling with every subsequent encounter, even as it grows and changes into something different with the passage of time. I imagine that's what it's all about for every traveler who passes through a train station, anywhere in the world.